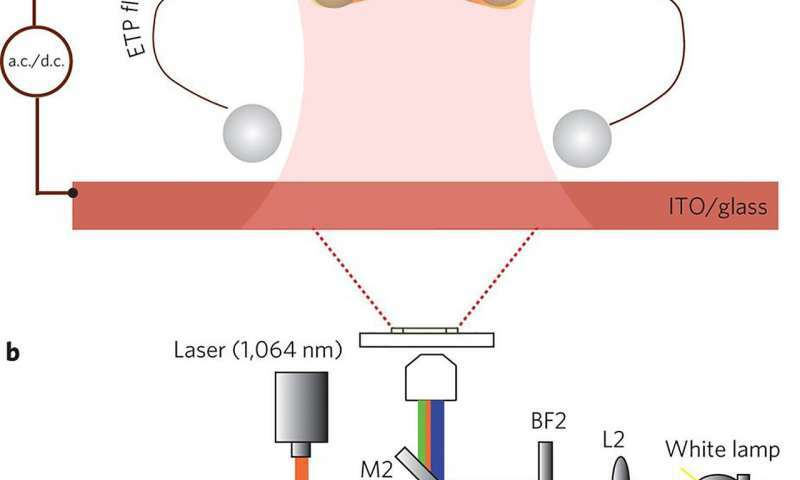 Purdue University researchers have developed a new class of optical nanotweezers that can trap and detect biomolecules, viruses and DNA more rapidly. The technology can also use light to promptly detect cancer or improve the production of medications, an important step forward as nearly half of Americans have used at least one prescription drug within the past month. The researchers developed a nanostructured plasmonic metafilm by perforating nanoscale holes in a gold film. Then, the metafilm acts as tweezers to capture and trap tiny particles by focusing light onto specific spots on the film and by heating up those spots and creating local thermal gradients in the ambient liquid. This produces a small tornado-like effect. "All of this is resulting in a revolutionary compact lab-on-a-chip – an innovative approach to detecting and diagnosing a tumor or a viral disease," said Alexander Kildishev, an associate professor with Purdue's School of Electrical and Computer Engineering, who helped lead the research team. The Purdue plasmonic metafilms use a combination of thermal and electric fields to create hydrodynamic flows that result in the rapid transport of suspended particles, bringing them to the surface of the metal film for easy trapping and detection. Another advantage of the new system is the increased ability to sort these tiny particles and then collectively detect sorted patterns such as drug contaminants or water impurities. The technology has potential applications for pharmaceuticals, biohazard detection and water quality tests. "To our knowledge, our plasmonic nanotweezers are more robust in trapping and detecting molecules than previous comparable lab-on-a-chip systems," Kildishev said. "Our system also provides better sensitivity and consumes less laser power. We have created an advanced self-contained lab-on-a-chip platform that allows us to trap and detect dangerous particles such as drug and water contaminants and remove them from liquids." "Our system is very flexible to control and provides a broad range of functionality," Kildishev said. "We use multifunctional, inexpensive light sources to outperform more expensive alternatives." The Purdue nanotweezers could be also used with these inexpensive broadband light sources for combining noble metal and dielectric nanoparticles, which could have applications for long-lasting, non-fading color printing.